March 08 - This is the latest we've ever left it to do an update and it is an indication of the fact that we may have not got our work life balance right during the past month. We did enjoy our Easter but somehow forgot to take our camera with us and therefore no major pictures. From the images below you will see that the weather was less than kind. Even when we did get try to get our bikes out we found that Jane's bikes had punctures. She did set out on her very old Triumph Palm Beach only for the tyre to develop a major bulge and then explode before we reached the edge of the village. We went to see Mary Shelley's Frankenstein at the Royal and Derngate Theatre in Northampton at the beginning of the month. It was a very modern production with parallel stories - the traditional story of Frankenstein and his monster alongside the events surrounding a mother who had killed her infant child and was in a secure mental hospital. She was a more modern monster, as perceived by society and to some extent she was also a product of the society that labelled her as a monster. The audience consisted of a load of sixth formers who were somewhat fidgety and not for the first time Steve had a weirdo sitting next to him. The weirdo was humming and mumbling to himself for about ten minutes into the first act when he suddenly got up and left the auditorium, never to return - what a relief. Overall it was a very good production that we enjoyed. After seven years of pushing the old motor mower around our lawn there were some crunching noises and it gave up the ghost. Steve believes in a throw away society because it helps to keep the economy balanced and so he persuaded Jane that a new mower was needed. 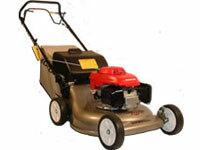 The reputation of the small Honda engines is excellent and so we purchased a Honda Izy 564. Once it was put into the barn Steve was hankering for some decent weather so he could give it "run" round the lawn however he waited for over two weeks before he got to play with it. In less than 45 minutes the lawn was cut to perfection. We experienced some atrocious weather. One weekend it seemed to rain day and night with some very high water levels in the rivers around Northampton. 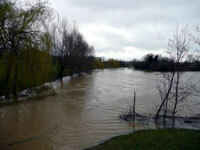 The flood defences are consistently working and there was no serious flooding of roads or houses. We got out for some good walks and tried to capture the results of the swollen rivers. Of course if the temperature drops and there's precipitation in prospect then it snows. The few centimetres in this picture were soon gone. 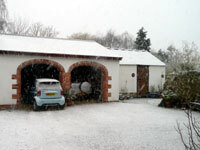 There's something about snow that really lifts the spirits and excites the senses. On this particular morning the snow had disappeared by the time we were out of bed and dressed. Jane got into conversation with the wife of one of the farmers who live in the village and she was talking about fallen trees for logging. It turned out that they had a willow that had fallen close to a pond and onto a fence. After taking a look at the situation we asked Nick and Val if they wanted to come and help. We spent a pleasant if noisy couple of hours cutting up all the branches that had fallen into the field and cut them back as far as the fence. 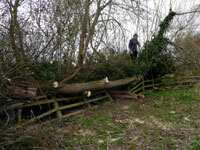 The picture shows Nick standing on the very end of the fallen trunk after removing two trailer loads of wood. Jane followed this up by getting permission for us to remove part of the broken fence and cut up the rest of the tree. Most of this work took place in April.